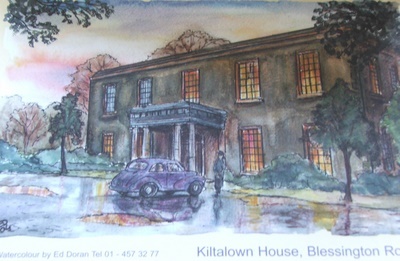 Kiltalown House is an elegant country house situated on the Blessington Road in the townland of Jobstown. Kiltalown has some fine features, particularly the windows, portico and doorway. The portico has a pair of Doric columns and full entablature, and the doorway has a carved timber surround with fanlight. Kilatalown has a hipped slate roof and extensions and barns / outbuildings at the side – to the rear of the house. It is in use today as an holistic health centre. Belgard Castle is a large three storey eighteenth century house attached to a medieval tower. The tower has Georgian Gothic windows and battlements and the dining hall has Adamesque plasterwork. The house now serves as the headquarters of CRH Holdings. The house is associated with the Talbot family, known as the Talbots of Belgard, who were in occupation of the castle as far back as the 15th century and according to St John Joyce, they had to frequently defend it against forays from the nearby Irish in the mountains. Belgard is first mentioned at the close of the fifteenth century, and was then the residence of Robert Talbot, son and heir of John Talbot, of Feltrim, near Malahide (Ball). In the time of Charles the First and during the Commonwealth, John Talbot of Belgard, took sides with the Confederate Catholics, and his estates were consequently forfeited, after which he followed the adherents of the monarchy into exile and rendered distinguished service in the war in Flanders. On the Restoration the estates were restored to the family “for reason known onto the King in an especial manner meriting his grace and favour.” At the war of the Revolution, Colonel John Talbot of Belgard espoused the cause of James II and fought at the battles of the Boyne and Aughrim, and the estates would no doubt have been forfeited a second time but for the fact that Colonel Talbot was included in the Articles of the Treaty of Limerick (St John Joyce). He was the last of the Talbots of Belgard, and following his death in 1697, without a male heir, his estate passed to the Dillon family. Subsequently it came into the possession of Colonel Dillon’s eldest son, Henry Dillon, who married a Miss Moore. He was a man of very considerable wealth, and great hospitality. They had a deer park and shooting lodge in the Tallaght Hills, near Ballinascorney (See Ballinascorney House / Dillon Lodge ). Belgard subsequently passed in succession into the Trant, Cruise, Kennedy, and Lawrence families. Dr Evory Kennedy was President of the Royal College of Physicians in Ireland. His grandson Sir Henry Lawrence was also a grandson of Sir Henry Lawrence, founder of British rule in the Punjab and defender of Lucknow. Paige Dickinson, the architect and a prominent figure in the Georgian Society, another grandson of Dr Kennedy, was born in Belgard Castle. Sir Henry Lawrence’s widow sold Belgard to the Maude family in 1910. 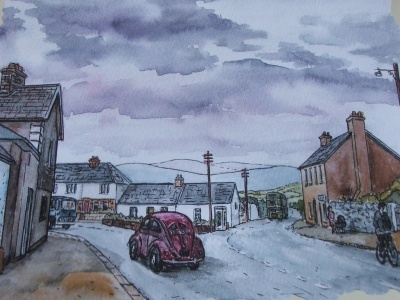 The twentieth century saw Tallaght undergoing the biggest changes in its history. In the 1960s, Dublin County Council planners decided that a new town would be built around Tallaght Village. This decision started the process that turned Tallaght from a small country village into the place we know today. Further significant changes took place in the 1990s with the construction of major buildings such as The Square Shopping Centre, the hospital and IT Tallaght. With the reorganisation of local government in the Dublin region, South County Dublin came into existence and set up its headquarters in Tallaght in 1994. Since the early 1970s, Tallaght has developed from a small village into a huge suburban area, with a population of over 100,000. It is still a rapidly changing area. The designation of tax incentive sites and the arrival of the LUAS have encouraged a development boom. In 1324, building commenced on Tallaght Castle and it was finished some time before 1349. A century later, it was reported to be in need of repair. This picture shows what remains today of Tallaght Castle. One of its ancient towers was incorporated into the buildings of St. Mary’s Priory. In 1792, the then Church of Ireland Archbishop of Dublin, Archbishop Hoadley, demolished the castle and built himself a palace on the same grounds. By 1821, the palace too had fallen into ruin and an Act of Parliament was passed stating that it was unfit for habitation. The palace was then demolished. 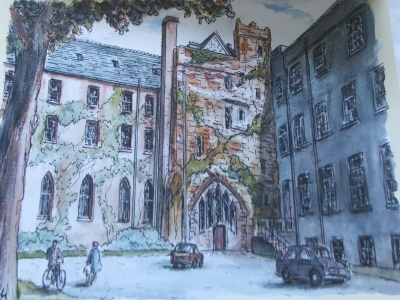 St. Mary’s Priory was founded in 1855 by the Dominican Order and became a centre for Christian learning. 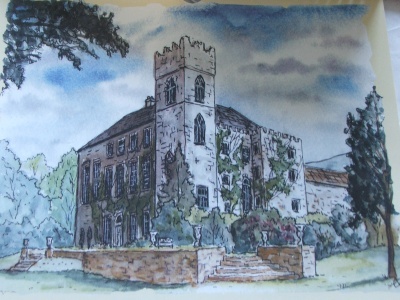 An ancient tower from Tallaght Castle was incorporated into the new Priory building.